Video by Rice Professor Julia Morgan, taken from a helicopter on July 16, shows lava from the ongoing eruption of Kilauea on the Big Island of Hawaii as it moves from the volcano to the sea. Morgan and her colleagues spent a week placing ocean-bottom seismic instruments off the southeastern shore of the island. 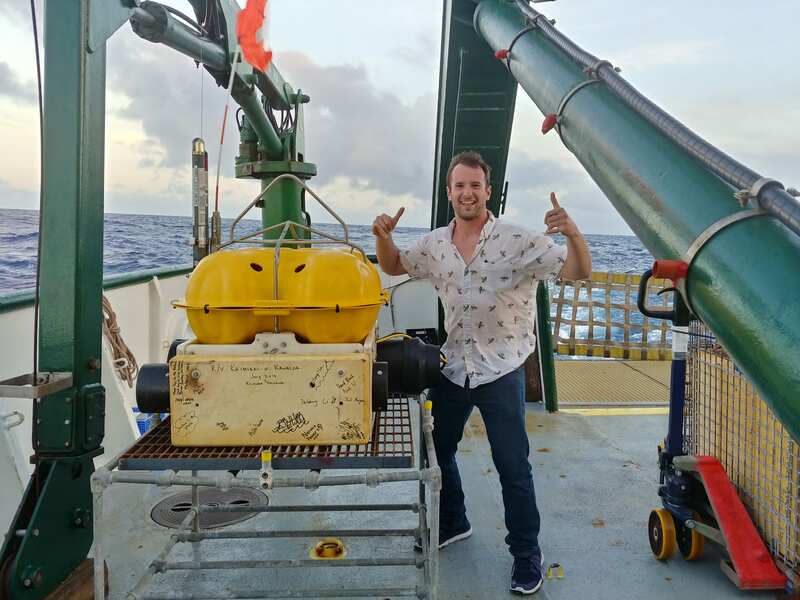 Rice University researchers joined a team of scientists placing seismometers under the ocean off the coast of Hawaii, where the ongoing eruption of Kilauea has already claimed more than 700 homes and added to the island’s landmass. The researchers hope for new insight about the landscape under the ocean floor. 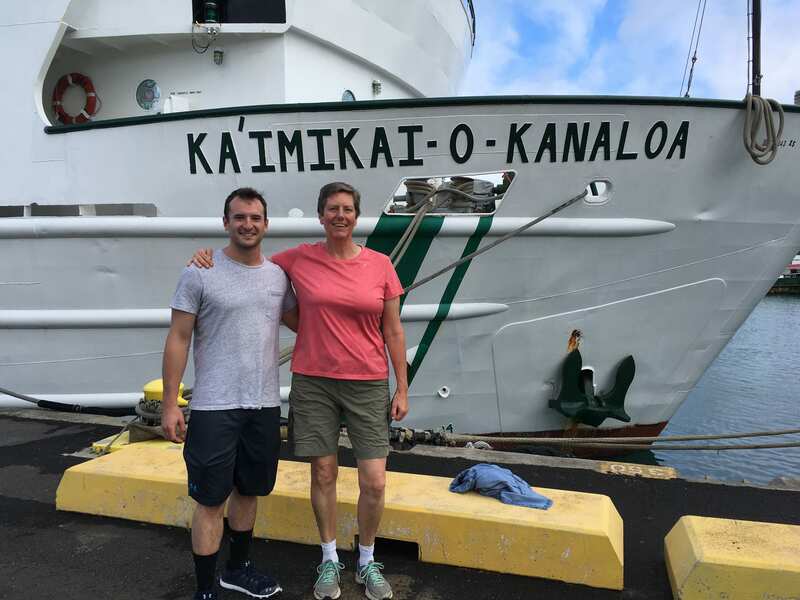 Julia Morgan, a professor of Earth, environmental and planetary sciences, and student David Blank were awarded a National Science Foundation RAPID grant to join a team of researchers and seed the seafloor with a dozen seismic detectors off the southeastern coast of the island in the wake of the 6.9 magnitude earthquake that occurred at the start of the eruption of Kilauea May 4. The instruments will gather data until September, when they will be retrieved, and are expected to provide an extensive record of earthquakes and aftershocks associated with the eruption of the world’s most active volcano over two months. Rice University graduate student David Blank and geophysicist Julia Morgan. Her interest in geologic structures, particularly relating to volcano deformation and faulting, led her to study the ocean bed off the Big Island’s coast for years. In a 2003 paper, Morgan and her colleagues used marine seismic reflection data to look inside Kilauea’s underwater slope for the boundaries of an active landslide, the Hilina Slump, as well as signs of previous avalanches. The researchers determined that the Hilina Slump is restricted to the upper slopes of the volcano, and the lower slopes consist of a large pile of ancient avalanche debris that was pushed by Kilauea’s sliding, gravity-driven flank into a massive, mile-high bench about 15 miles offshore. This outer bench currently buttresses the Hilina Slump, preventing it from breaking away from the volcano slopes. “We mapped out the geometry and extent of the slump and tried to develop a history of how it came to be,” she said of the paper. “Essentially, Kilauea is a bulldozer sliding out on the ocean crust and scraping off packages of strata that have accumulated,” Morgan said. The Hilina Slump rides on top of the sliding flank, she said. “Remarkably, after this earthquake, all the boundaries of the slump also lit up with small earthquakes. These clearly occurred on a different fault than the main earthquake, suggesting that the slump crept downslope during or after that event,” she said. Morgan said the bench appears to be stable, presumably supporting the slump — although if it collapsed, the slump would follow and the results could be catastrophic. “If the slump were to fail catastrophically, it would create an amazing tsunami that would hit the West Coast. We have not seen this in historic times,” she said. While the risk of an imminent avalanche is slim, she said, the eruption, earthquake and aftershocks presented an irresistible opportunity to get a better look at the island’s hidden terrain. Every new quake that occurs along Kilauea’s rift zones and around the perimeter of the Hilina Slump and the bench helps the researchers understand the terrain. Morgan said the United States Geological Survey, which operates the Hawaiian Volcano Observatory, has a host of ground-based seismometers but none in the ocean. She said monitors at sea will reveal quakes under the bench that are too small for land seismometers to sense. The seismometers are deployed around the Hilina Slump, close to shore where lava is entering the ocean and on the outer bench in line with the initial quake. “That way, aftershocks from the earthquake could be picked up and would record characteristics of the fault zone that slipped,” she said. Rice University researchers who joined colleagues on the Big Island of Hawaii this month to place seismic instruments also took the opportunity to fly over the ongoing eruption of Kilauea July 16. With their pilot and standing from left: Jackie Caplan-Auerbach of Western Washington University, Julia Morgan of Rice, Yang Shen of the University of Rhode Island and David Blank of Rice. While Blank worked days on the ship to help deploy the instruments, Morgan chose the night shift for mapping – and a better view of lava hitting the water. After their duty at sea, both took the unique opportunity to book a helicopter flight over the volcano, following the river of lava to the sea.